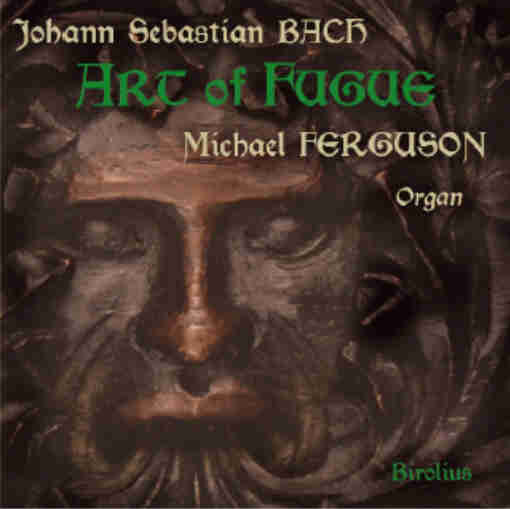 Birolius Editions presents Michael Ferguson's new recording of Bach's 'Art of Fugue'. NOW AVAILABLE: Michael Ferguson's complete organ performance of Bach's Art of Fugue, recorded on two CDs in full 20-bit digital stereo. Featuring the 56-rank Schantz organ of the Church of St. Leo the Great (St. Paul, Minnesota), and Ferguson's completion of Bach's unfinished quadruple fugue, Contrapunctus XIV. To place an order, choose 'Art of Fugue CD' from the menu at left. Or to read the reviews, choose 'CD Reviews'. To order other Birolius Editions items relating to the Art of Fugue, including scores of Ferguson's completion of Contrapunctus XIV, as well as other musical scores and many MP3 music files available for previewing and downloading, choose 'Catalogue'. NEW IN THE CATALOGUE: Michael Ferguson's new organ work, RICERCAR upon Three Ancient Chorales, as well as Capriccio by John Ireland, and Fugue in C Minor by Maurice Duruflé, including also a free PDF download of the public domain organ score of the Duruflé fugue.